The fight over AMP seems like the distant past. Three years ago this controversial project breathed it’s dying breath and gave birth to a regional plan built on community involvement and engineering studies. 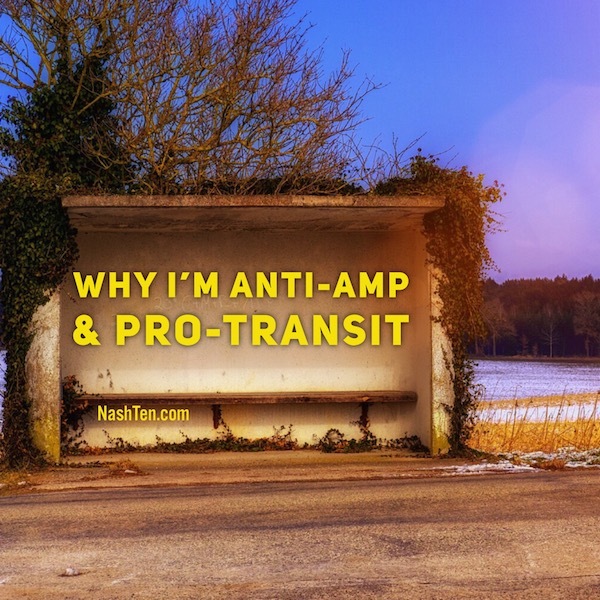 AMP was sold as a way to bring two parts of the city closer together instead of focusing on improving transit. And spend $200 million in the process. It was poorly conceived and failed because it did not solve a significant problem. While the East Nashville bus route was one of the most utilized by passengers, the West End route had one of the lowest rider counts. And AMP was to have a dedicated bus lane in each direction on West End Avenue and Gallatin Rd. If it weren’t for the dedicated lanes, AMP would probably be alive and kicking today. But taking away 50% of the lanes on two of the busiest commuter routes into downtown was not a smart idea. At least in my book. It seemed more like a legacy project than something that would help the traffic woes in Nashville. Since I’m not keen on spending millions to create more problems, I decided to not support this project. And I was happy to see that they took the remaining AMP money to start a new study. One that was based first on consumer sentiment and real transit solutions across the region. The public input phase of the NMotion plan resulted in more than 18,000 individuals engaged in the process including more than 9,000 survey responses. The result was an overwhelming support for a long-term investment in mass transit and the infrastructure to make it effective. This includes improvements to buses, routes, facilities, roads, sidewalks, and tracks. And how you could get from your home to work both seamlessly and quickly across Greater Nashville. State law requires transit plans to be implemented on a county by county basis. Nashville has to lead the way in order for the rest of the surrounding counties to follow. That’s the reason for the referendum on May 1st. Our vote tells Metro Council that we support their implementation of the transit plan. So far, the transit detractors have not provided a comprehensive “alternate” plan based on consumer studies and science. That means this is an all or nothing vote. While I don’t think the current plan is perfect, I think it is the best answer that we have to solve the traffic problems that we face today and those that will follow. If we punt now, it will be at least three more years of studies and public input to develop an alternate plan without light rail. I don’t believe an individual or community can stand still. You are either growing or dying, there is no in between. Without a solution to our traffic problems, our city will soon turn the tide. And, I’d prefer to live in a Nashville that’s growing. What are your thoughts on the transit plan? If you have questions hit reply and I’ll get you answers. The Daily Deal in Nashville is this renovated condo in a great location Green Hills that is listed for less than $300,000.